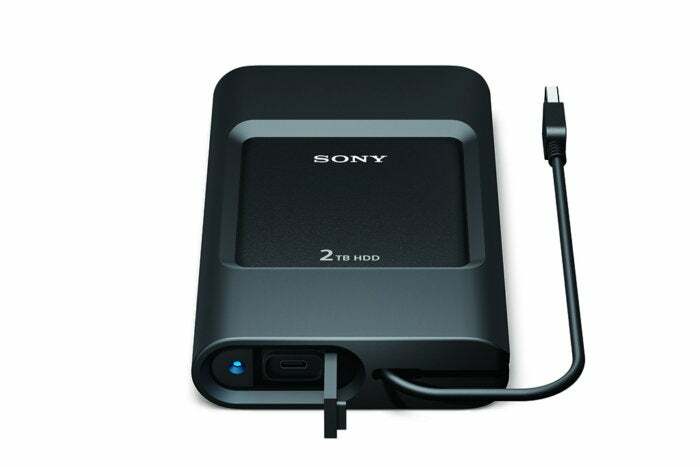 The Sony PSZ-HC1T quickly became one of my favorite external hard drives to use around the lab. Why? Because it’s rugged and has a captive USB cable. If I had a nickel for every time I’ve held my breath after accidentally banging a drive, or every second I’ve wasted hunting down a cable, I’d be a rich man. Speaking of everyone’s relative financial status, those perks do cost you a bit—at around $110, the PSZ-HC1T sells for $50 more than most 1TB external USB 3.1 drives. Still, if you’re prone to being rough on your equipment, consider that it’s still cheaper than replacing a less sturdy unit. This review is part of our ongoing roundup of the best external drives. Go there for information about other competing products and how we tested them, plus our top picks. The PSZ-HC1T is larger and heavier than the average 2.5-inch external hard drive, measuring approximately 6.6 x 4 x 1.2 inches and weighing 13.5 ounces. That’s due in part to the heavy-duty rubberized jacket, as well as the captive USB cable with its Type-A connector, but there’s undoubtedly some internal shock absorption. Along with the the captive cable, there’s also a USB Type-C port hidden beneath a captive rubber plug. The PSZ-HC1T is not waterproof, but the jacket and plug will certainly help ward off problems caused by spilled beverages, etc. 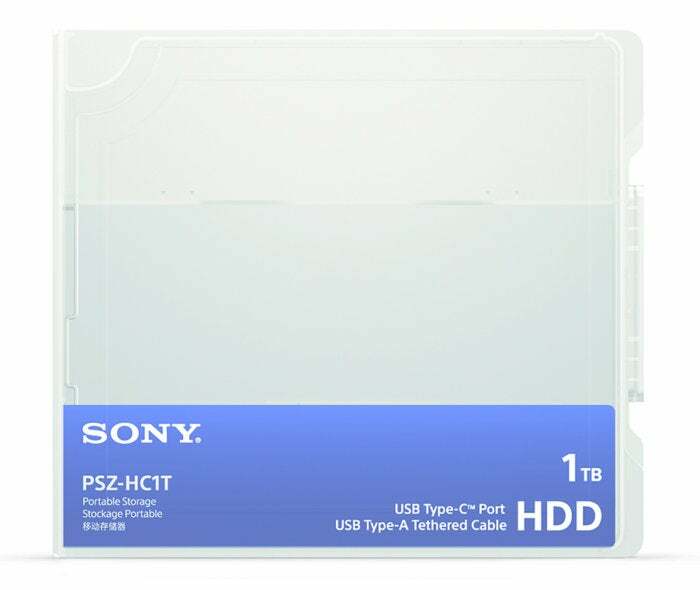 The PSZ-HC1T (or HC2T, the 2TB model, shown here) have a shock-absorbing rubber jacket and a captive USB type A cable. The PSZ-HC1T ships inside a large protective plastic case that provides additional protecting when transporting or shipping the drive. Artistic types who are transferring projects to studios or post-production facilities will certainly appreciate that. So will backup experts. The list goes on. Kudos to Sony for even thinking about that. The company calls this a Pro drive, and it means it. The PSZ-HC1T ships with a heavy-duty plastic container that’s suitable for mailing or other iffy modes of transport. Because the PSZ-HC1T is a pro product, I was hoping for a five-year warranty rather than the three-year warranty it has. 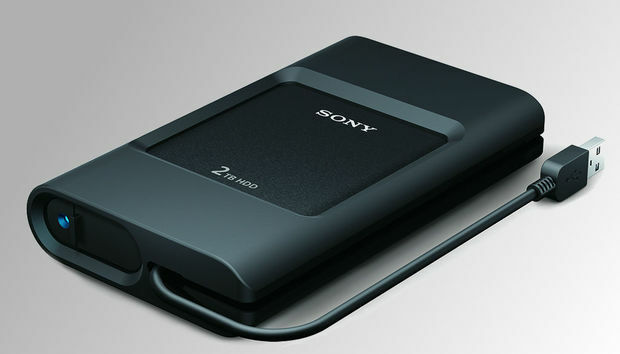 Three years is standard for portable hard drives, but this isn’t just any portable hard drive. Sony claims a transfer rate of 138MBps on the PSZ-HC1T’s box, and that’s almost exactly what I saw during testing. Of course, that’s also just about what you’d get from any 2.5-inch hard drive in a USB 3.1 Gen 1, 5Gbps enclosure. Color me not-surprised, though with the emphasis on ruggedization for this product, you never know. 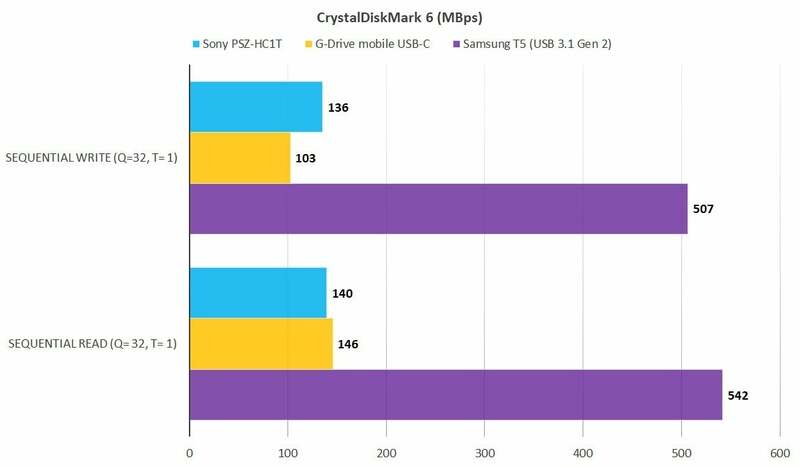 Though not the fastest external USB 3.1 Gen 2 hard drive we’ve tested, the PSZ-HC1T (blue bars) is certainly competitive. Longer bars are better. The Samsung T5 is an SSD, hence the much faster performance. 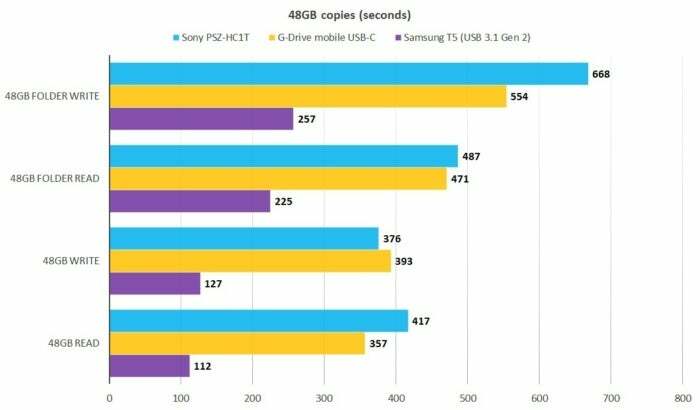 The Samsung T5 is a USB 3.1 Gen 2 (10Gbps) SSD, included on the charts to illustrate just how much faster such a beast is. Lacking moving parts, it’s also quite rugged, though the cost per gigabyte is much higher. AS SSD 2.0 related the same story as CrystalDiskMark, very good, but not outstanding performance. Longer bars are better. Note that the G-Technologies G-Drive mobile USB-C, which is a slim drive and not ruggedized, did prove a bit faster in our copy tests than the PSZ-HC1T. However, the PSZ-HC1T was also formatted in exFAT for cross-platform compatibility. You’ll get much quicker small file performance if you format it to NTFS. In my home systems (including two Macs), it do this and use Paragon’s NTFS for Mac to enable writing with macOS. 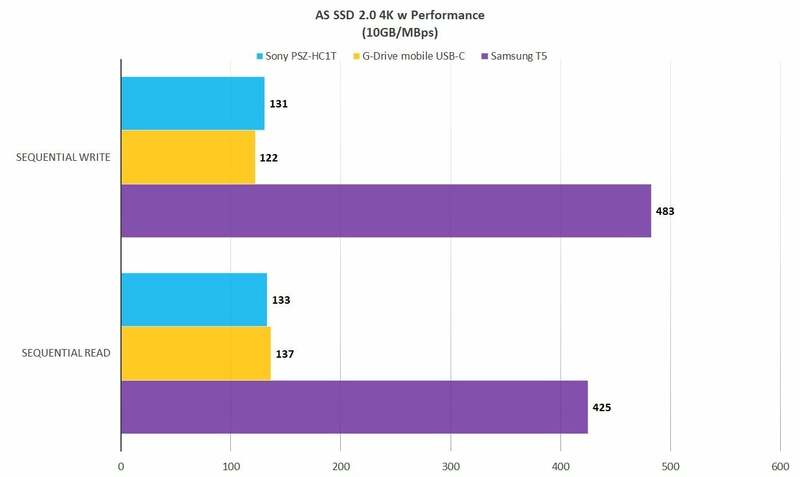 The PSZ-HC1T was faster writing our single 48GB test file, but otherwise proved a bit slower than the G-Drive mobile USB-C—a non-ruggedized product. In general, the PSZ-HC1T is more than fast enough for its intended role. You could get picky, but it’s not so far off the pace that I’d sweat the difference. The PSZ-HC1T is a decent performer, but it’s the drive’s relatively high tolerance for abuse, its handy captive cable, and its robust shipping box that make it noteworthy. Little usability perks like those go a long way toward user satisfaction, even given that you’re paying more. As I said, it’s the hard drive I’m currently using around the lab. FAQ: Can BlackBerry/TCL get back its smartphone mojo?